Thanks to an international global network of airports and airlines, the world is an ever smaller place. And thanks to that network, it is possible to arrange express and economy parcel delivery, worldwide, at an amazingly low cost. Alternatively, if your requirement is for economy worldwide delivery, there are options to reduce shipping costs, so long as your customers are prepared to wait a little longer for their shipment to arrive. Goods for express worldwide delivery will nearly always travel in an aircraft for much of their journey. There are two main ways express freight travels by air, on passenger planes or via a dedicated freight aircraft. Much of the world’s air freight actually travels on commercial flights in the Hold beneath the feet of the passengers. Whilst the upper part of an aircraft is fitted with seats, the space lower down in the airframe may be fitted with runners to accommodate pallets of goods. During the passenger disembarking at their destination, a ground crew is often busy removing pallets of Cargo, in order to get them cleared by customs and shipped on to their local destinations. Alternatively, air freight may travel on dedicated chartered freight aircrafts, usually recognisable due to their lack of windows. Such aircraft often fly from smaller airfields, or take flights at unsocial hours when passenger flights are less in demand. There is also a third type of aircraft, sometimes called a “combi”, which has a passenger deck split lengthwise, with part of the deck on one side of a bulkhead fitted out for freight, while passengers sit in the other portion. 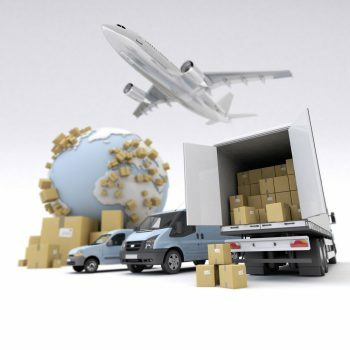 Depending on the destination in the world where goods are traveling it is possible to have the cargo arrive next day. Aircraft crossing the busy Transatlantic routes, for example, can leave a European city in the morning and arrive on the east coast of USA in the early afternoon, making a same day delivery possible for the extremely urgent shipments. If you want to ship goods by express air freight, your best starting point is to contact a logistics company, Smart Directions for example, who specialise in international shipping. They can advise you on the best ways to access the network of international air routes, and also help navigate your way through the necessary customs rules, regulations and paperwork. Smart Directions are experts when it comes to express and economy parcel delivery. Only by understanding the pitfalls of shipping around the world and adhering to the local customs requirements by filling out the correct and necessary paperwork will reduce the risk of unnecessary hold ups by the airport inspectors or local customs. An unexpected hold-up can waste the time saved by sending a shipment quickly as air freight, which will lead to a frustrated customer. Therefore, call on a specialist today, if you are planning to send goods by air for express delivery to worldwide destinations. If you would like to disucss your European or worldwide Express and Economy Parcel Delivery requirements, or just want to learn more about logistics or any of our courier and freight services. Call Smart Directions, UK and Hertfordshire Freight and Logistics experts, and speak to one of our UK logistics service experts on 01442 507240 or contact us here. You might even want to get an online quote for Same day delivery or Next day delivery too. What are the Brexit Consequences for Logistics?